Baton Rouge, Louisiana – Monday, September 12, 2016 – Lamar Advertising Company (Nasdaq: LAMR) today announced that Sean Reilly, CEO of Lamar Advertising Company, is scheduled to participate in a question-and-answer session at the Goldman Sachs 25th Annual Communacopia Conference in New York City, NY on Tuesday, September 20, 2016 at approximately 12:25 p.m. (ET). Founded in 1902, Lamar Advertising Company is one of the largest outdoor advertising companies in North America, with more than 325,000 displays across the United States, Canada and Puerto Rico. Lamar offers advertisers a variety of billboard, interstate logo and transit advertising formats, helping both local businesses and national brands reach broad audiences every day. 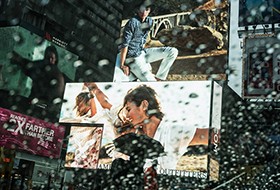 In addition to its more traditional out-of-home inventory, Lamar is proud to offer its customers the largest network of digital billboards in the United States with over 2,500 displays. Please feel free to explore our website www.lamar.com or contact us for additional information. Big brands, including McDonald’s and Comcast, have long used billboards to promote their products, but now even tech companies such as Foursquare, Lyft and Snapchat use them. Lamar Advertising Company (Nasdaq: LAMR), a leading owner and operator of outdoor advertising and logo sign displays, announces that its board of directors has declared a quarterly cash dividend of $0.76 per share payable on September 30, 2016 to stockholders of record of Lamar’s Class A common stock and Class B common stock on September 16, 2016.